My love affair with cupcakes began at Saint Cupcake Bakery during my sophomore year at college in Portland, OR. I guess I must have led a sheltered life or something, but I had never tasted cream cheese frosting until then. After Saint Cupcake's Big Top cupcake (vanilla cupcake with chocolate chips and cream cheese frosting, as shown above), there was no turning back. It became an obsession of mine to try and conquer all cupcake stores. First there was Saint Cupcake, Cupcake Jones (GREAT red velvet cupcakes, but the stuffed cupcake concept is a bit much) and The Sugar Cube (overrated, but into the idea of a cupcake food cart) in Portland, OR. Then, in nearby Seattle, there was Cupcake Royale (loved the lavender buttercream, but was underwhelmed by lack of variety, especially the frosting variety) and Trophy Cupcakes (lives in Cupcake Royale's shadow, but is far superior, especially the lemon cupcake and accompanying frosting). In San Francisco, the city I lived in post-college, there was CupKate's moveable cupcakes truck (good cupcakes, terrible waits), Cako Cupcakes (great flavors, but inconsistent quality), Miette (ohgodwayoverratedshootmenow), and Kara's Cupcakes (IMO, best in SF, especially the passionfruit and sweet vanilla flavors). I even went out of my way to try the ever-so-famous and incredibly underwhelming Magnolia Bakery cupcakes in New York! But somewhere along the way, as I stood in yet another half-an-hour long line for an overpriced baked good that was no bigger than the palm of my hand, I grew disillusioned. I guess this wasn't uncommon -- that is, I wasn't the only one who began to thought that cupcakes were passé -- but that wasn't what really turned me off the whole cupcake scene. What did was the trendiness of it all. Who knew that food could be so trendy? I began to be wary of food trends -- the food trucks, the macarons, the cake pops, Korean-Mexican fusion, gluten-free, insert-the-latest-cool-thing-here. I was well aware that I was apart of it too, with my cupcake obsession. 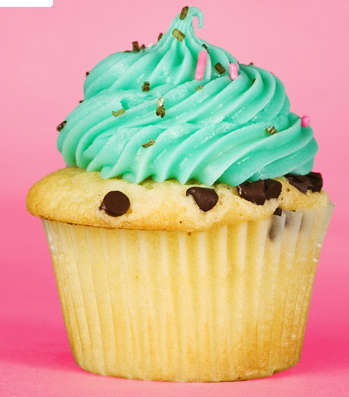 While I still loved cupcakes, I stopped actively seeking them out and eventually grew distracted by other baked goods and desserts like macarons and odd-flavored ice cream. So it was really out of nostalgia when, this summer, I stepped into the Hummingbird Bakery during a summer trip to London, England (elevation: 78ft). I had come across the South Kensington Road shop by chance; my dad was on a quest to find an old hole-in-the-wall kebab place from his post-college days living in London. Since I wasn't a fan of kebabs, my dad had coerced me to help with his quest by promising me a cupcake for dessert. Now, England isn't exactly known for their food -- if anything, the country is rather notorious for its bad-cooking. I mean, no offense or anything, but this is the land where blood pudding and haggis is celebrated. My standards for British cupcakes (known as "fairy cakes") were low since British interpretations of classically American food were always pretty grim (see: Garfunkel's). I expected a sampling of chocolate and vanilla cake with the obligatory matching frosting, but not much else. As for red velvet, my favorite cupcake? I believed it was primarily an American recipe, one that I would be hard-pressed to find in England. I think I literally yelped in surprise when I saw a batch of fresh red velvet cupcakes proudly on display, along with creative flavors such as strawberry-rhubarb, fruit tea, and chocolate malt. Still wary of British cooking, I restrained myself and purchased one red velvet cupcake. 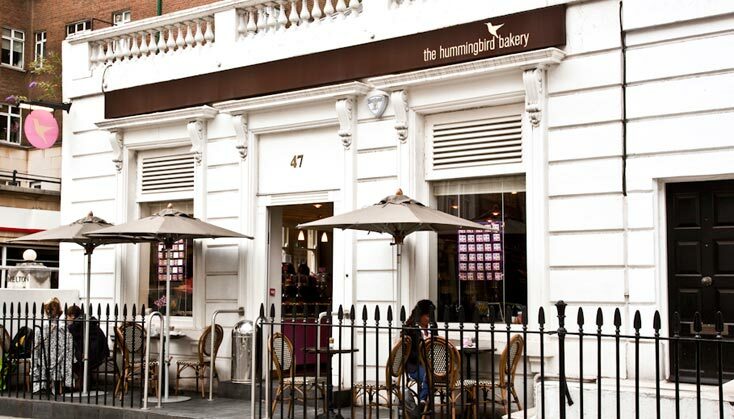 I'd tasted a lot of cupcakes over the last few years of my life, but I can honestly say that Hummingbird Bakery's cupcakes are some of the best cupcakes around. 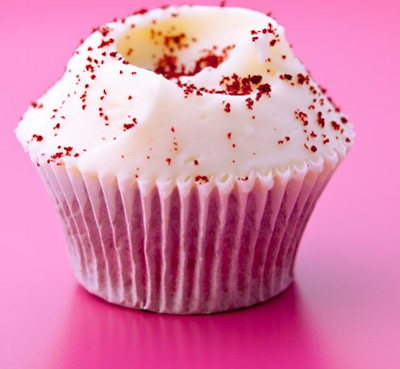 Unlike most cupcakes that have a spongy, airy, and slightly sticky texture, Hummingbird Bakery cupcakes were dense and had a slight crumby texture. This crumby texture was also unexpectedly moist and was well complemented by slightly stiffened, thicker frosting (as opposed to the smooth texture most American frostings tend to be). The moment I got back to San Francisco, I purchased The Hummingbird Bakery Cookbook with strong approval from Kiron, a Brit and a good friend of mine who claimed that he had seen the book turn his friend from a mediocre baker to a phenomenal one. And indeed, every recipe I tried from the book was a huge success and seemed to perfectly replicate the cupcakes I had had in London. The photo above is my own (excuse the iPhone) shot of the first batch of cupcakes I had made in San Francisco (elevation: 52ft) using recipes from the Hummingbird Bakery cookbook. The cake was vanilla, topped with lavender frosting and white chocolate shavings. Yikes! The perils of high-altitude baking, indeed. After searching frantically online to see if a more experienced baker before me had adapted the Hummingbird Bakery Cookbook's recipes for high altitude, I found nothing. I suppose I should have known better, given that I was searching for a somewhat esoteric (at least, in the US) cookbook that was also British. England definitely lacked the tall mountains that constituted high-altitude living. But nevertheless I searched high and low for days on end. Alas, all I could find were generic (and not to mention frighteningly inconsistent) tips on how to adjust for baking in high altitude. And, to add insult to injury, no one adjustment seemed sufficient to work for the Hummingbird Bakery Cookbook recipes, which were generous with baking powder (more on this later), sugar, and a whole mess of other ingredients that didn't work quite the same way that they did at sea-level. Hence the frightening goop you see above. I sighed. It looked like I would have to do the dirty work myself. And so here it is, my blog, The Hummingbird on High -- also known as my amateur baker's attempt to adjust my beloved Hummingbird Bakery Cookbook's recipes (created in London, England with an elevation of 78ft) to work at the harsh, unfriendly baking environment of Denver, CO (elevation: 5,280ft). 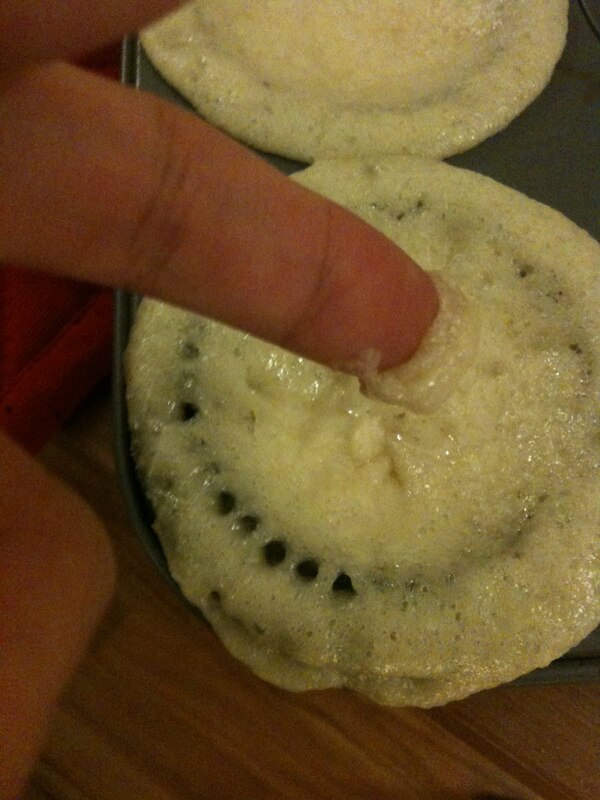 Expect many failures, frustrations, and puddles of inedible goop.